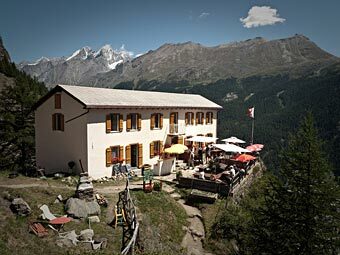 The Pension Edelweiss is a short hour’s hike away from Zermatt located at 1961 Meters/6500 Ft above sea level (Coordinates 623194/96788). The unforgettable view of the surrounding mountains invites you to enjoy and relax. If you take a look from the train station to the right you can see the Edelweiss situated on top of a rock. Now you follow Bahnhofstrasse towards the Matterhorn to the Grampi-Bar (opposite Hotel Post) and turn right into a narrow alley. The path winds uphill through a meadow and forest until you arrive at Edelweiss after less than an hour’s hike.